TheTournament of Roses parade in Pasadena California. They make more than 300 appearances each year - constanty on tour. The hitch takes three tractor trailers with a crew of 7 to travel town to town for appearances. It takes between 30 minutes to an hour to braid each horses mane & tail each day. 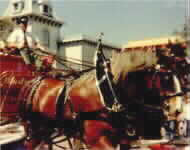 The brass & leather harness for the 8-horse hitch took eight months to make and is valued at $40,000. A Columbus, Ohio firm makes the brass fittings. 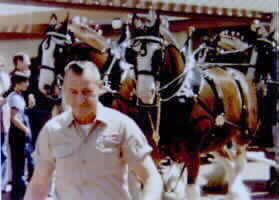 The horses stopped by this past year (1997) at my small town. The names of the horses: Jerry & Mark, (the 2 lead horses) Barry Jim, Willy, Kendall, Clancy, & Baron.The 8 horses are geldings and stallions ranging from 3 to 5 years in age. There is a 6 hitch horse team based at the Santa Anita Race track in Los Angeles, California pulling the starting gate for races. 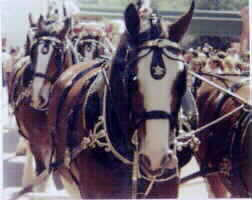 August A, Busch Jr. acquired the original Clydesdale team in 1933. The horse breed is a heavy draft horse that originated in Scotland and improved through cross breeding with Flemish stallions, decendents of large horses bred centuries ago to carry armor-clad knights into battle. 15 to 20 foals are born each year on the Clydesdale Farm located in suburban St. Louis County in the state of Missouri. Its near the former home of United States 18th President, Ulysses S, Grant. The horses used for the touring team are bred to be gentle, have a bay color, four white stockings, a blaze of white on the face and a black mane & tail. Horse shoes are hand forged 20 to 25 inches overall in length. 1 shoe weighs over 4 pounds, measuring to 9 inches front to back. Each of traveling team horses eats a strict diet of 50 pounds of hay, mixed with fresh grass & 30 quarts of oats per day.